Peel and mix 4 frozen bananas together with an electric mixer until smooth. Next, mix in 2 tablespoons of cocoa powder. Top with either fruit, grain-sweetened chocolate chips, unsalted peanuts, or all three! Makes 4 servings. I am also sharing this recipe with Joy of Desserts, Simply Sugar and Gluten Free, Beauty and Bedlam, Lady Behind the Curtain, Miz Helen’s Country Cottage, This Chick Cooks, Food Trip Friday, Sweet as Sugar Cookies and Cybele Pascal Allergen-Free Cuisine. 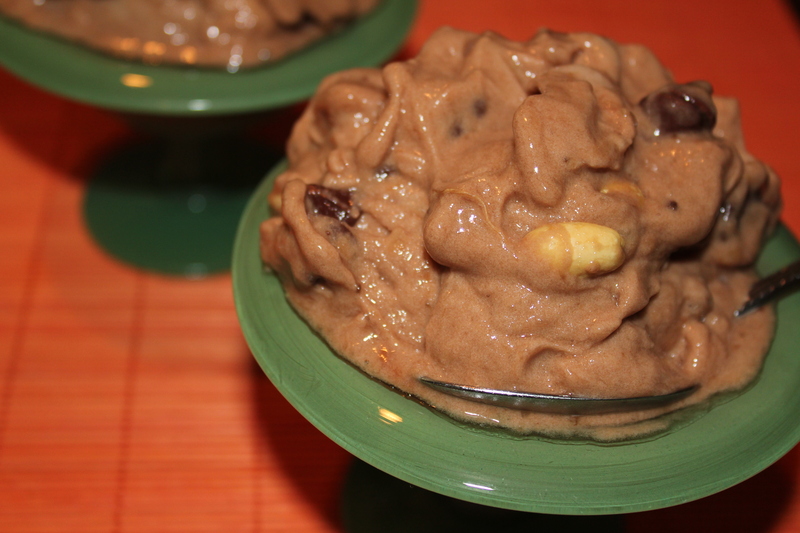 This entry was posted in Recipes - Dessert and tagged Chocolate Banana, Peanut. Bookmark the permalink. Thank you so much for sharing your wonderful recipe with Full Plate Thursday. Hope you are having a great week end and come back soon!